Positron emission tomography-computed tomography (PET / CT) is one of the key and newest methods of oncological diagnostics. The study of PET / CT allows you to identify oncological diseases in the early stages that are difficult to detect using CT, MRI and ultrasound, to determine the degree of complexity of the disease, its prevalence in the body and prescribe the correct treatment. 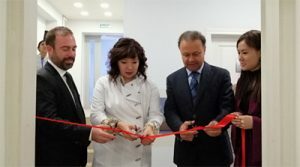 The project was implemented by the Turkish company Orhun Medical LLP together with the Kazakh Research Institute of Oncology and Radiology with the direct financial participation of the leasing company KIC Leasing (“Kazakhstan Ijara Company” JSC). At the moment in Kazakhstan there are only two same equipment in Astana, one of which is already became obsolete. Mr. Gonenc Dirik, Director of Orhun Medical LLP, and Mr. Yusuf Karsi, Director General of KIC leasing, told us about the details of the implementation of this project and the difficulties encountered. The total volume of new transactions of research participants for the past year grew by 39%, and some industry representatives increased their annual turnover several times. Participants in the leasing market associate the growth of the industry last year with the revival in the economy. It is obvious that public authorities are interested in leasing as one of the most promising and effective financial instruments. At present, state bodies carefully analyze the situation in the industry, study problems and mechanisms for the development of the leasing market. In the structure of new deals for the first time in a long time, the largest industry was not agriculture – a significant part of the volume of new business in 2016 was leased railway equipment, and in 2017 this segment became the largest in the market for leasing financing.